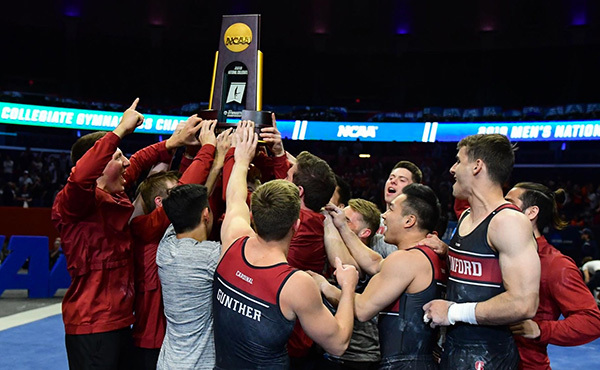 INDIANAPOLIS, March 30, 2019 – The USA is competing in several rhythmic gymnastics competitions this weekend. Today, Lily Avila of Highland Park, Ill./Vitrychenko Academy Corp., and Annaliese Dragan of Irvine, Calif./Nimble Rhythmic Gymnastics, won silver and bronze medals in the senior and junior event finals, respectively, at the 2019 Juliet Shishmanova Tournament in Burgas, Bulgaria. 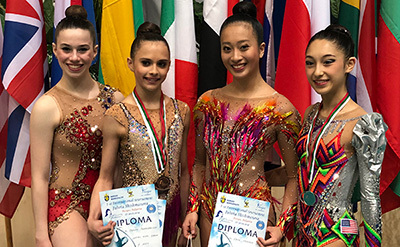 Additionally, Evita Griskenas of Orland Park, Ill./North Shore Rhythmic Gymnastics Center, won the senior all-around silver medal at the MTM Ljubljana (Slovenia) Tournament, where Esther Kiseleva of Wayne, N.J./Liberty Academy, was the junior all-around silver medalist, and Gemma Gow of Newton, Mass./Rhythmic Dreams, won the pre-junior all-around crown. In the senior hoop final, Avila outscored Bulgaria’s Vaya Draganova for the silver medal, 17.800 to 17.600. Bulgaria’s Tatiana Volozhanina took the title at 20.000. Volozhanina and Italy’s Nina Corradini finished one-two in both the senior ball and clubs final: Volozhanina, 21.550/ball and 20.100/clubs; and Corradini, 19.900/ball and 18.400/clubs. Bulgaria’s Lachezara Pekova finished third (19.400) in ball, while Italy’s Talisa Torretti was the clubs’ bronze medalist (18.100). 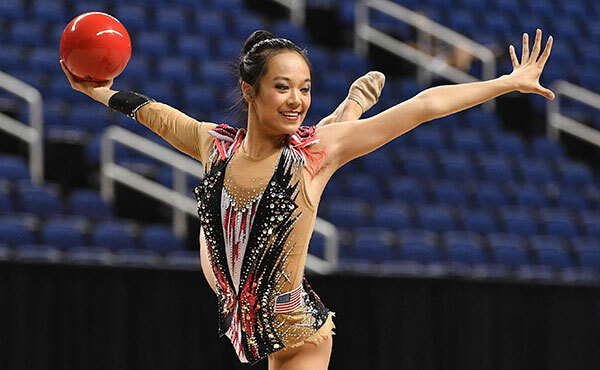 Heather Chan of Irvine, Calif./Eurogymnastics, landed in fourth for clubs (16.800) and fifth in ball (16.850). Eliza Cohen of Los Angeles/California Rhythms, was fifth in clubs (13.300) and Avila placed seventh in ball (13.350). Draganova and Torretti both earned a 17.300 in the ribbon final, but Draganova got the gold via a tie-breaker. Volozhanina was the bronze medalist (16.300). Chan was fifth (13.750), with Cohen in seventh (11.900). For the junior event finals, Dragan competed in all four finals and brought home two bronze medals for rope and ribbon. For her bronze medals, Dragan posted a 13.550 for rope, with a 13.850 in ribbon. Italy’s Sofia Raffaeli won all four gold medals: rope, 18.200; ball, 18.500; clubs, 19.300; and 18.600, ribbon. Bulgaria’s Eva Brezalieva was the rope (16.500), ball (16.100) and ribbon (14.300) silver medalist. Egypt’s Mariam Elguindy was the ball bronze medalist (11.800). For clubs, Bulgaria’s Valeria Vatova posted a 15.500 for second, and Russia’s Maria Evstifeeva was third with 11.700. Dragan was fifth for ball (11.400) and clubs (11.500). 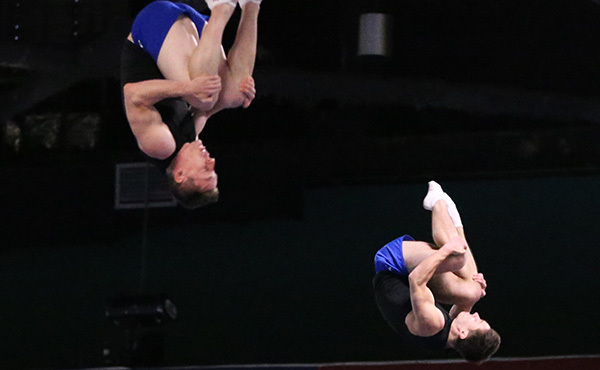 The USA will compete in every event final at the MTM Ljubljana Tournament, which wraps up tomorrow. The seniors who will compete in event finals are: hoop – Griskenas and Lennox Hopkins-Wilkins, Puyallup, Wash./Evergreen Rhythmics; ball – Griskenas and Lili Mizuno of Northbrook, Ill./North Shore Rhythmic Gymnastics Center; clubs – Hopkins-Wilkins and Griskenas; and ribbon – Griskenas and Mizuno. In the junior division, here’s the U.S. athletes participating in the event finals: rope, clubs and ribbon, Kiseleva and Ciel Arzandyan of Van Nuys, Calif./Rhythmic Academy of Los Angeles; and ball, Gergana Petkova of Barrington, Ill./North Shore Rhythmic Gymnastics Center, and Kiseleva. Gow will compete in the clubs final, the only event final for the pre-junior division. Griskenas scored a 71.200 for the senior all-around silver. Italy’s Alexandra Agiurgiuculese took the title at 72.600. Slovenia’s Aleksandra Podgorsek was third at 68.850. Mizuno and Hopkins-Wilkins had the fifth and sixth best all-around scores with 64.400 and 63.050, respectively. 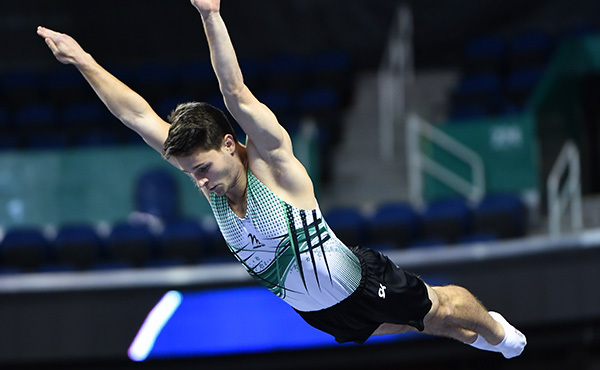 Griskenas, Mizuno and Hopkins-Wilkins finished in the top eight in all four events: Griskenas – hoop/19.200 for first, ball/18.500 for third, clubs/16.150 for fifth and ribbon/17.350 for second; Mizuno – hoop/14.950 for eighth, ball/16.900 for fifth, clubs/15.750 for sixth and ribbon/16.800 for third; and Hopkins-Wilkins – hoop/16.850 for fourth, ball/14.700 for seventh, clubs/16.350 for fourth, and 15.150 for fifth. Daria Merkulova, Grayslake, Ill./North Shore Rhythmic Center competes Sunday in the non-FIG senior competition. Kiseleva tallied a 58.000 for second in the junior all-around. Ukraine’s Snizhana Oshchipko’s 59.150 put her at the top of the junior all-around rankings, and Russia’s Mariia Cherkasova was third at 57.10. Arzandyan was fourth at 54.050. 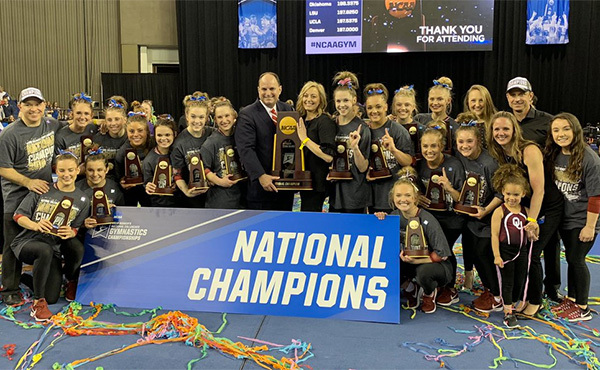 Due to the two per country rule in all-around rankings, the following U.S. gymnasts did not have an all-around ranking: Petkova, 51.650; and Patricija Ivanauskaite of Clarendon Hills, Ill./North Shore Rhythmic Gymnastics, 47.000. Gow participated in the pre-junior bracket, where she won the all-around and rope gold medals, plus the ball silver. Gow’s all-around two-event score was 29.100 to take the title, with Italy’s Tara Dragas in second at 27.950 and Israel’s Elinor Paritzki in third (24.850). 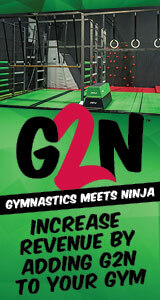 For rope, Gow earned a 14.050 for the top sport with Germany’s Anna Shenenko next at 12.600. Bulgaria’s Marina Dosheva was third (11.750). Gow barely missed the ball gold, her 15.050 put her behind Dragas’ 15.450. Paritzki was third (14.300). Dragas won the ribbon title with her 12.500.